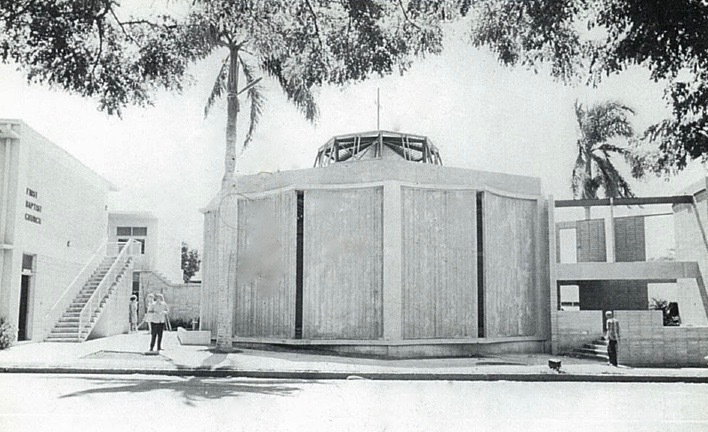 The First Baptist Church of Honolulu was officially incorporated in 1930. 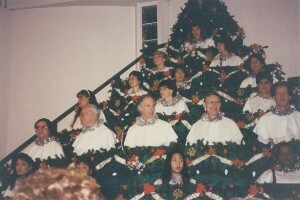 Our Baptist roots in Hawaii however can be traced back to the 1920’s. 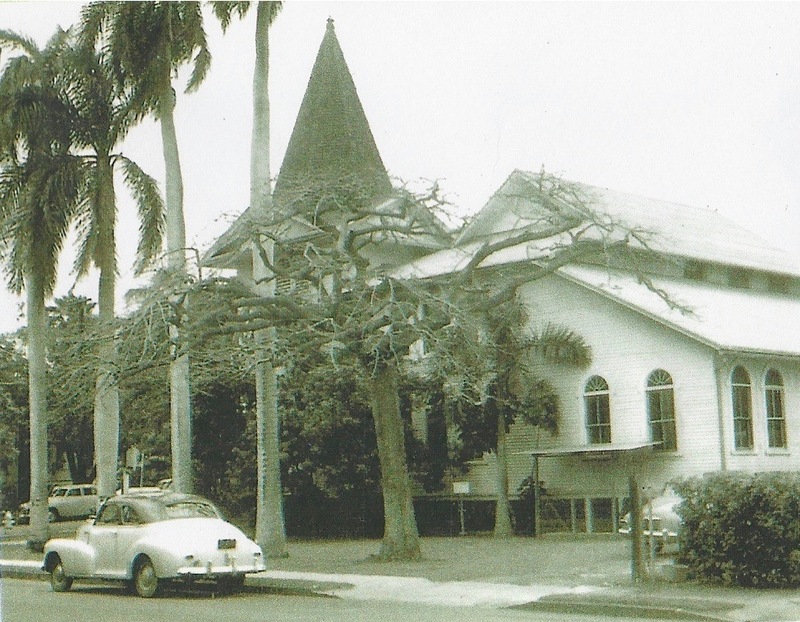 The church initially met at Queen Kaahumanu School. 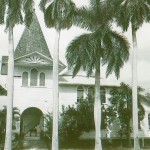 The property that our Ministry Center occupies today was purchased in 1938 and has been our “home” since that time. 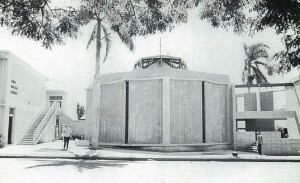 The current sanctuary was built in 1963. 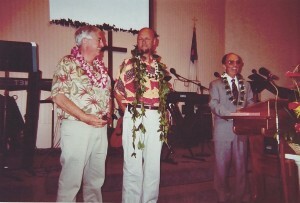 PASTOR LOVETT’S INSTALLATION SERVICE, JAN. 2004. 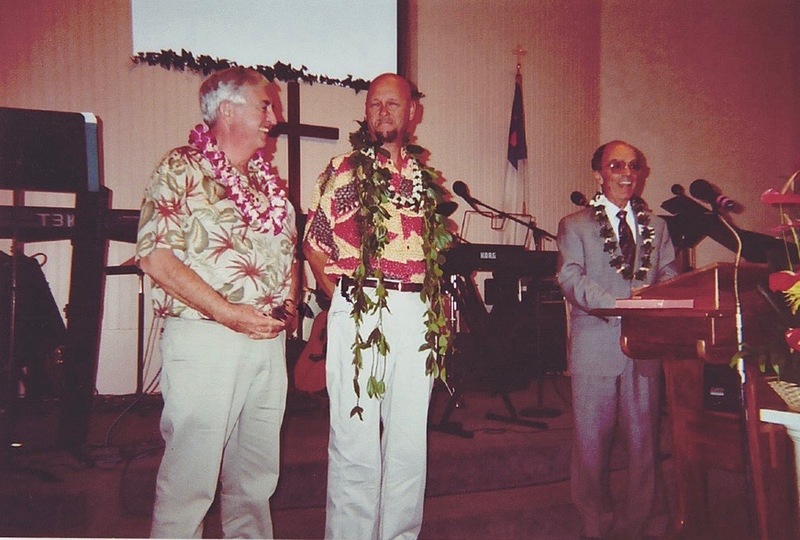 BILL PAUL, LEFT, WAS CHAIR OF THE PULPIT COMMITTEE, DALE SALICO, RIGHT, WAS THE EXECUTIVE MINISTER OF AMERICAN BAPTIST CHURCHES OF THE PACIFIC SOUTHWEST. The congregation today reflects the diversity of the neighborhood in which it exists and through the years has attracted a wide variety of people from all walks of life. The church has been a training ground for young, maturing disciples who have developed their leadership and ministry skills and then, literally, have gone into all the world. Today we continue to be strongly evangelical, passionately Biblical and unwaveringly committed to training and equipping disciples to share Christ’s love with our city and our world. Bob and Betty Bradford: I remember the trips over the Old Pali Highway to the Kailua Church to preach and then rushing back to FBCH to conduct the morning service. 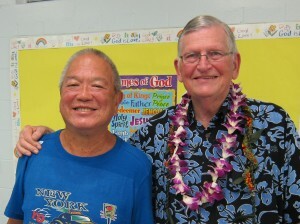 I recall the beginning of FBC of Pearl Harbor and meeting for the first time in a school classroom. 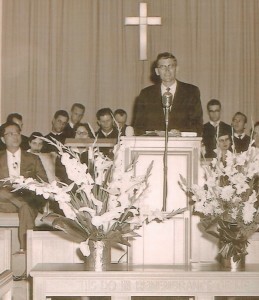 We did not have a pulpit, hymnal, or music. We were delightfully surprised to have eighty in attendance. In all three new churches we started, attendance boomed with many persons coming to Christ and many committing themselves to be in full time Christian service. Waxer Tipton: …my Sunday School class was poured into by many, like the Johnsons, and Rick & Jan Davis, and the Youth Group that was led by Rich Jacobson. We were so “trained up as children in the way that we should go” that I since followed the call to full time ministry and have been taken all around the world, preaching in churches, schools, parks and universities, planted a church and have seen hundreds come to know Jesus. My three best friends in that same group, the two Hamilton brothers, are successful Christian businessmen and active leaders in their churches and communities, and Tim Hawkenson is a full time youth pastor as well…I can only imagine the lives these men have touched and the fruit that is flowing all over the world. Vallerie Godley: I am thrilled to be able to write a few words about FBCH. It was there in February of 1979 that I turned my life over to Jesus… Ted and Beth Livingston had asked me to go to church with them many times. I always refused. They prayed and one day I came to church with them and was overwelmed by the feeling that God was talking directly to me. Each person at FBC touched my life and it has not been the same since. To say that I am grateful is not to even touch on how I feel. From the bottom of my heart, thanks to all those who started me along a path walking with Jesus. 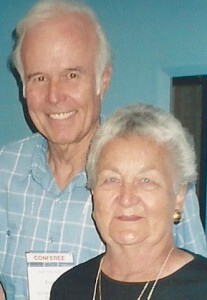 Fred and Theresa Hickernell: Fred and I had just been married June 25, 1954. At the end of July, I flew to Honolulu to stay with my parents while Fred was to go to Japan in the service of the US Air Force. Much to our surprise his orders were changed to a six week tour of duty at Wheeler Air Force base. He arrived the first of August and we had a second honeymoon. Fred left for Okinawa the middle of September, but I stayed in Honolulu with my parents. We attended the First Baptist Church of Honolulu. There was no minister and the congreation was under fifty in number. Most of the congregation was in the military when we first attended. We realized that there was much work and prayer needed in order to make the church grow. 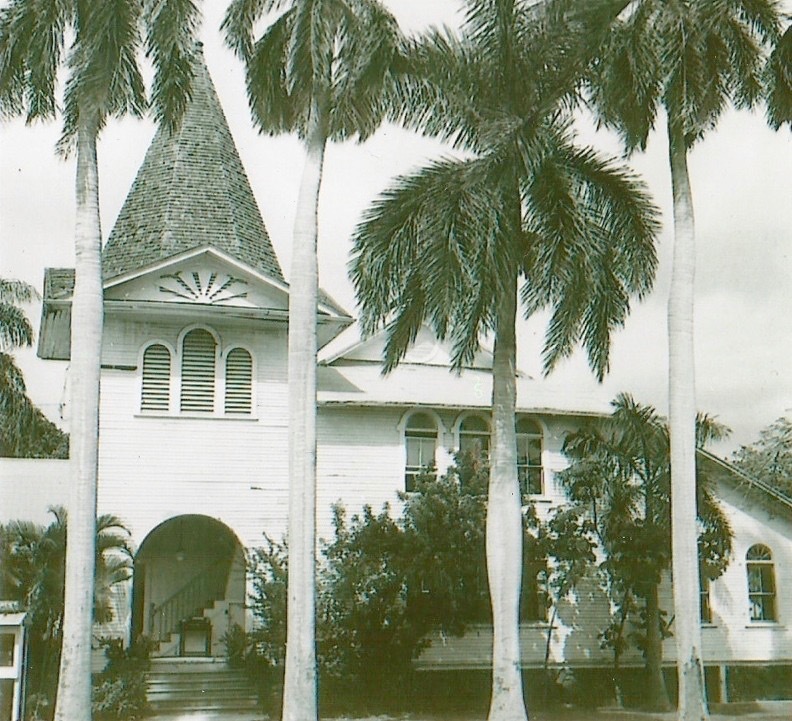 Dr. Harold L. Fickett, Sr. was called as the interim pastor to close the church because of its poor physical condition as well as its very few members. Even though he was retired and in his eighties, he was very active and energetic. He was just the right person to turn things around. The Church was in such bad condition that the wood porch fell through one Sunday morning. The service men and young people of the church were so caring of each other, possibly because they were so far from home and lonely. One couple had just gotten married in the church one evening, and the next morning many of these young people and servcemen showed up at the bride and goom’s doorstep with breakfast – weren’t they surprised?!!! Joyce Morse: In October 1975 seven of us singles met with pastor and started the “Positive Christian Singles”. Joe Sunderland was the youngest and I was the oldest. We were the first such group on the island and at one point, we had 60 or more attending from all different faiths. After about a dozen years it phased out as many other churches started their own singles group. I am still close to some of the people from this group and consider them family. 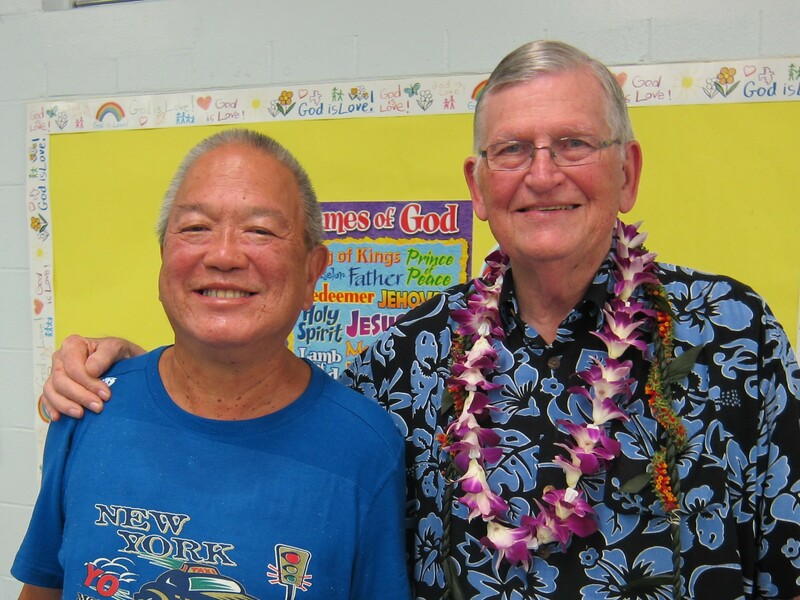 Jim and Louise Nikkel: Whenever we reflect upon the best years of our lives, we always pick the decade 1983-1993, our Honolulu years, and we are quick to add that the principal reason for this is our experience at First Baptist Church.